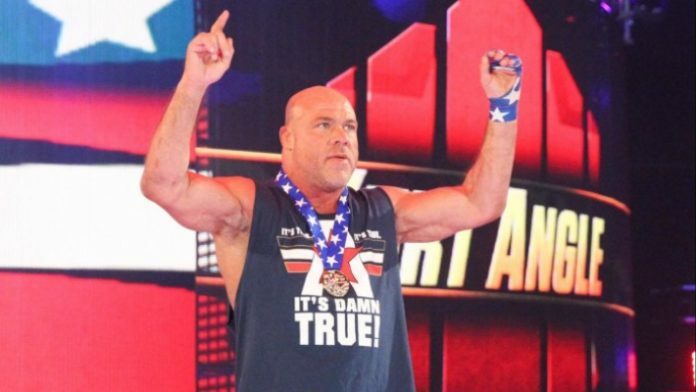 Kurt Angle has become a topic of discussion since he announced his farewell match for WrestleMania on last week’s episode of Monday Night Raw. After that, the company teased a number of final opponents for the Olympic Gold Medallist. Now it appears that we may have a possible candidate for the spot. As noted before WWE has announced that Kurt Angle will be revealing his WrestleMania opponent at the upcoming episode of Monday Night Raw. Angle has a relationship with Shelton and the two first started working together during the latter part of 2002 when Benjamin joined The World’s Greatest Tag Team. He along with his partner Charlie Haas were mentored by Kurt and these two ended up winning their first Tag Team Championship as part of the group. While Shelton won’t be as big opponent for him as John Cena or The Undertaker, their relationship has seen many ups and downs. So after this post, there is a possibility that we might actually see this bout. However, whether this match actually takes place or if WWE has anything else planned for the former World Champion will be revealed this Monday Night.